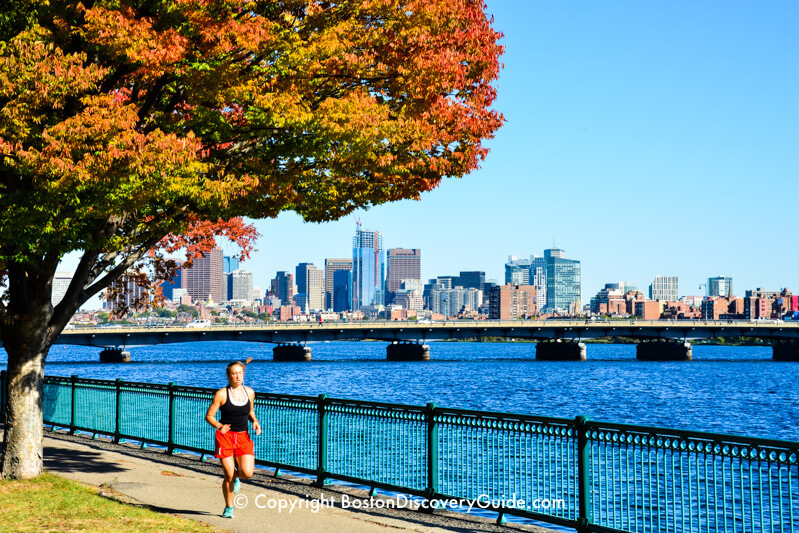 Boston's fall foliage blazes across the city from late September through October - and often well into November. 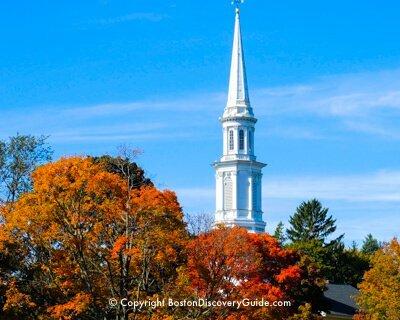 Although you can see lots of gorgeous leaves on New England fall foliage tours, you can also enjoy spectacular leaf color by touring around Boston on your own. Lots of tourists fly into Boston Logan Airport during the fall months - and then immediately depart for fall foliage tours or cruises to other parts of New England. But why spend money on gas just to drive along crowded highways? 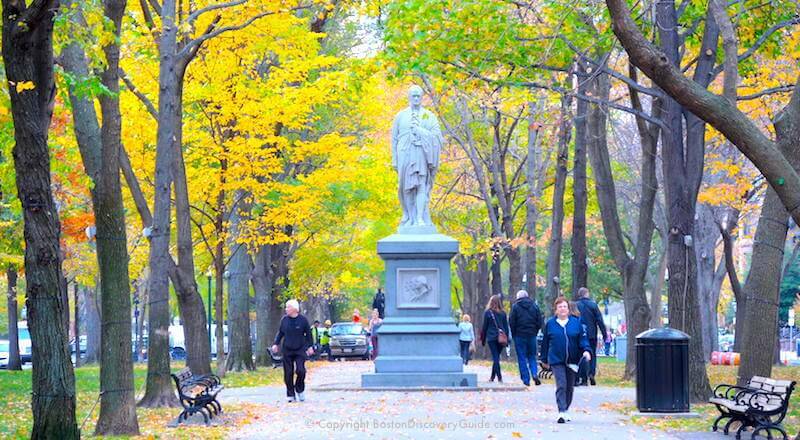 You can enjoy autumn's brilliant colors without leaving Boston . . . if you know where to go. 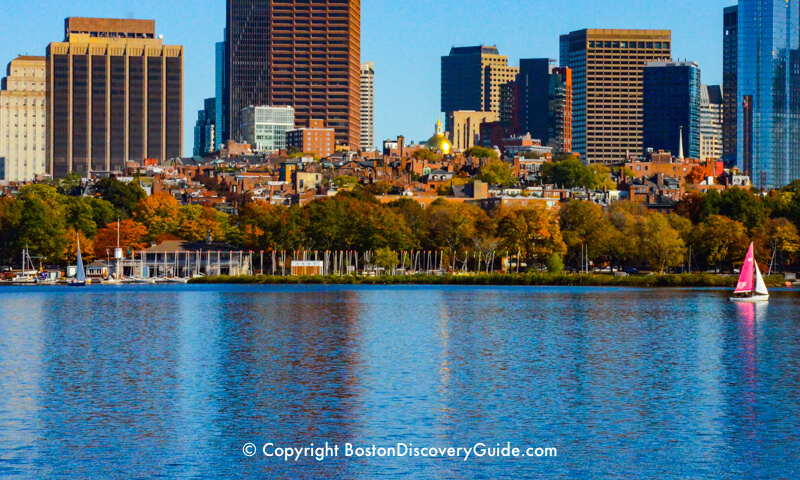 Here are Boston Discovery Guide's recommendations for the 10 best places for self-guided Boston fall foliage tours where you'll see breathtaking crimsons, oranges, and golds - right in the city. Want to see even more leaf color? Let someone else do the driving when you go on one of the popular New England fall foliage tours through southern New Hampshire and Maine. 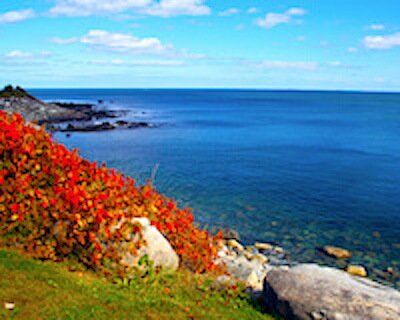 For another special experience, choose one of the popular fall foliage cruises up the coast of Maine and Eastern Canada. 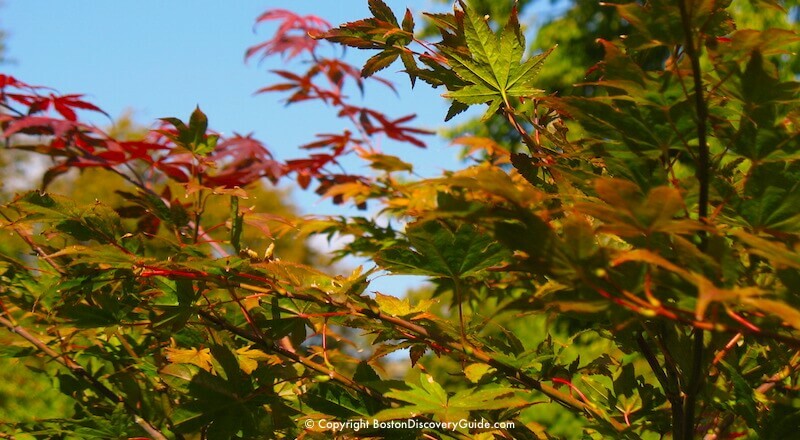 In the heart of Boston Proper, the Public Garden is where you'll usually spot the first bright splashes of fall foliage, usually on small ornamental Japanese maple trees. 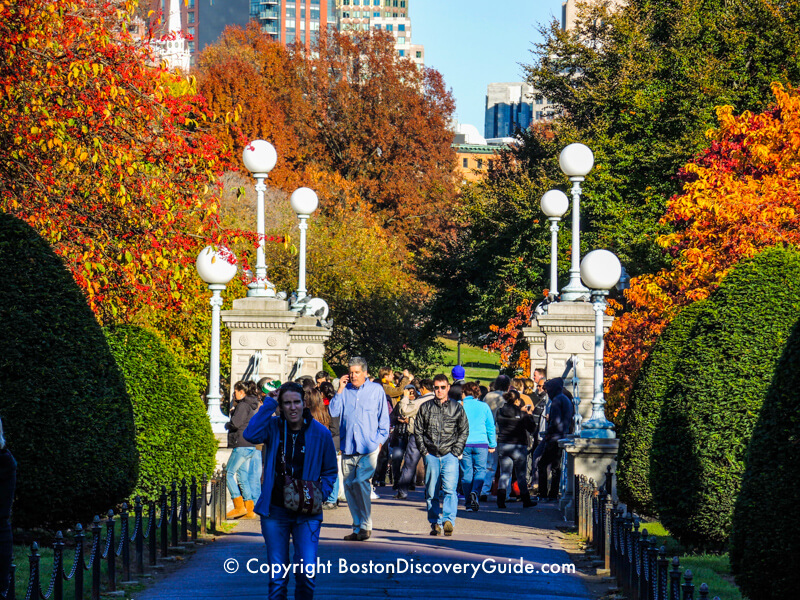 Dating back to Boston's Victorian era, the Public Garden contains dense groupings of specimum trees and shrubs from around the world. Each species changes color at a slightly different time, making a constantly shifting tapestry of autumnal tones. Late-blooming roses add to the colorful mix. 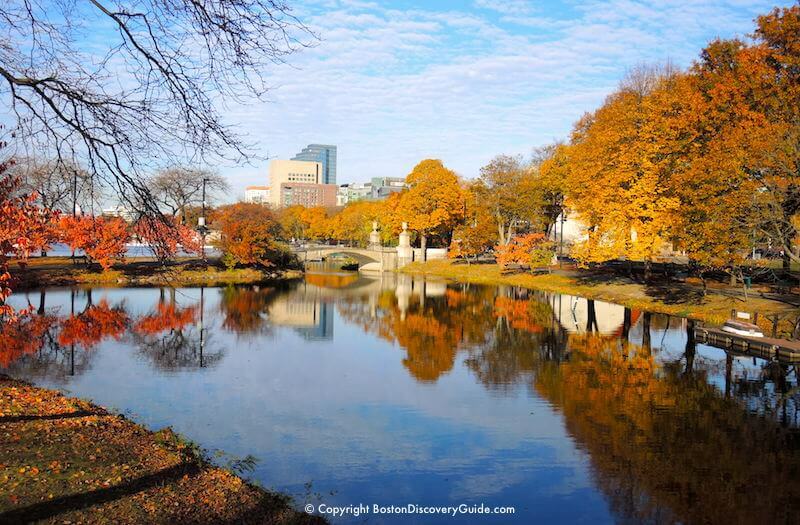 For even more stunning views, walk onto the foot bridge across the Lagoon in the Public Garden. If you're curious about the types of trees around you, look for brass labels with the botanical name under the trees. 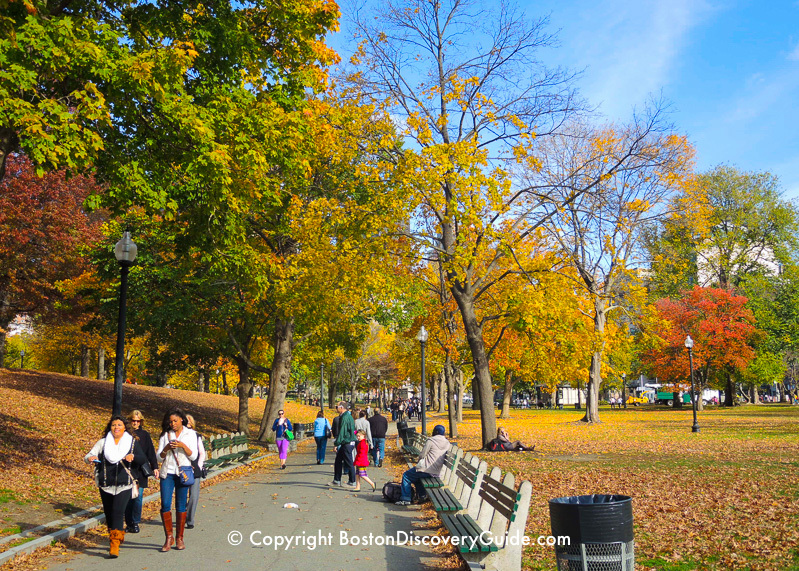 Boston Common, the 44 acre plot where the first English settler in the area built his cabin back in 1625 and a center of activity for Bostonians ever since, puts on a spectacular display of color throughout the fall months. Almost 700 oak, beech, chestnut, maple, and even elm trees are dotted across the Common. Several of these species change color late in the season, so the Common is a great place to see lovely fall foliage in November and even December. 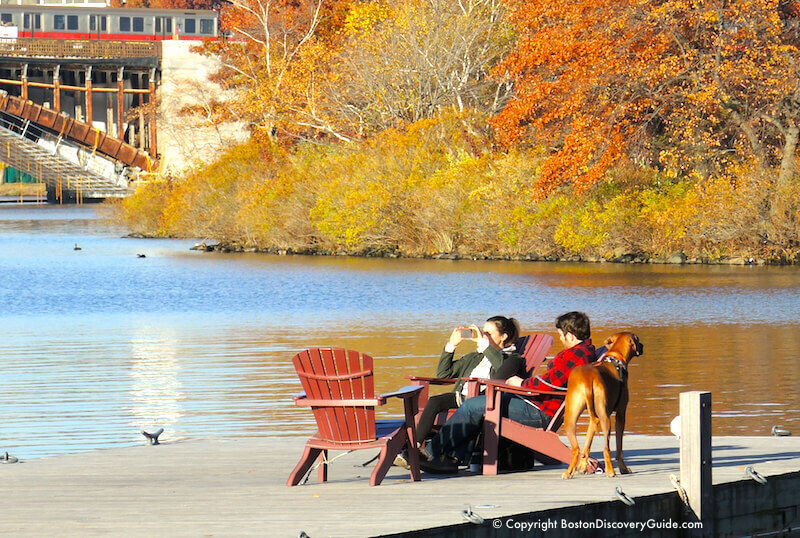 Autumn colors on the Esplanade - still brilliant in late November! 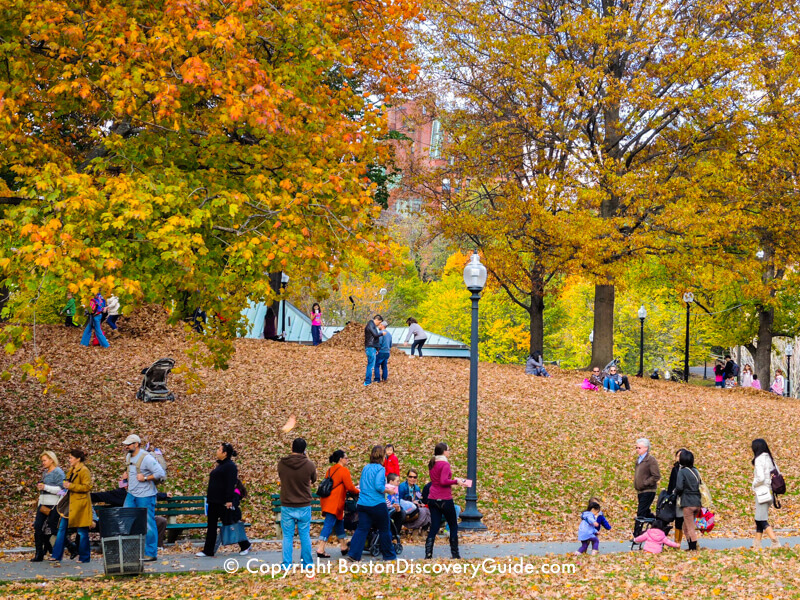 The leafy Boston Esplanade, the long skinny park stretching along the Charles River from Beacon Hill to beyond Back Bay, turns into a ribbon of gold and orange in October when Boston's fall foliage begins to reach its peak. You can walk, jog, or bicycle along the river paths and enjoy the dancing water reflections of the many-hued leaves. Bring your camera and capture the perfect photos of the colorful fall leaves along the river. Relax on one of the floating docks along the Esplanade - you'll feel like you're in another world! Getting to the Esplanade: You'll need to cross over busy Storrow Drive on a pedestrian foot bridge to reach the Esplanade from Beacon Hill or Back Bay. From Beacon Hill, use the bridge near the Charles/MGH station. Once you cross Storrow Drive, the Esplanade is to your left. From Back Bay, use the Arthur Fiedler footbridge near the intersection of Beacon and Arlington Streets. 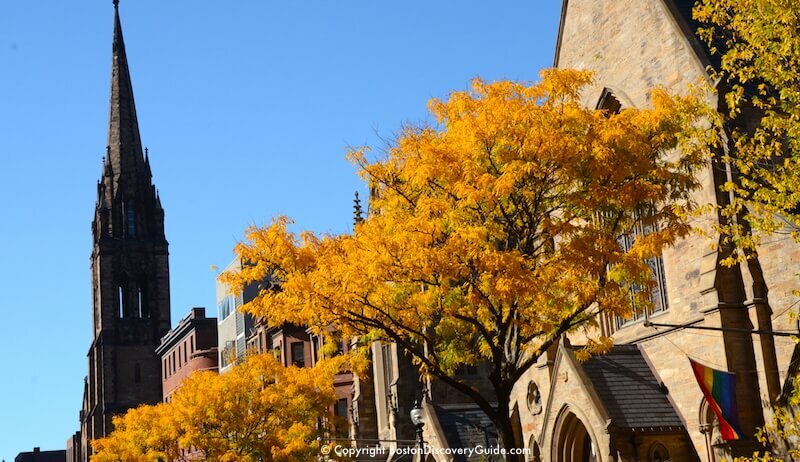 A walk through Beacon Hill lets you experience gorgeous leaf colors while enjoying Boston's oldest and most historic neighborhood. Start your walk on Charles Street, and then explore any of the side streets going up the hill where the narrow lanes and alleys blaze with color. Look closely, and you'll see glimpses of color from almost-hidden gardens. 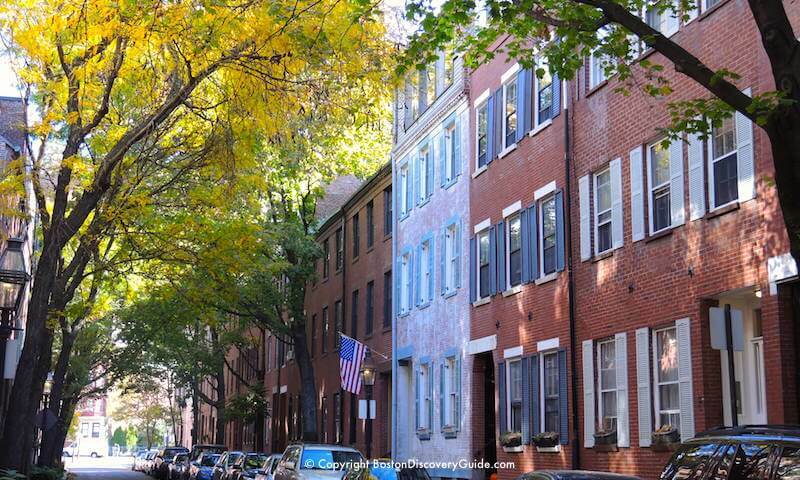 A particularly lovely walk is up Mount Vernon street to tree-filled Louisburg Square. Location: Beacon Hill is to the north of the Public Garden and Beacon Hill, across Beacon Street. 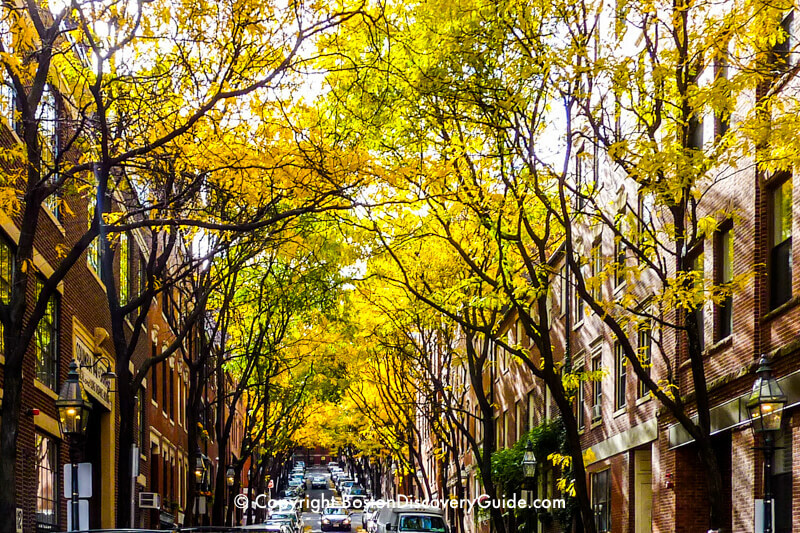 Leafy neighborhoods in central Boston provide great vistas for viewing colorful Boston fall foliage. 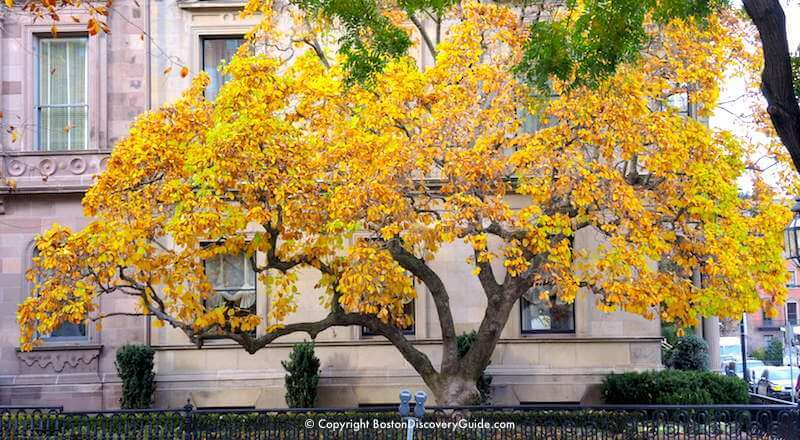 Particularly brilliant trees can be found throughout Bay Village, Back Bay,and the South End. Spend 10 minutes walking randomly through any of these elegant neighborhoods and treat your eyes to a panorama of colorful leaves and varied textures. In Bay Village, Boston's smallest neighborhood, Federal-period row houses built by the same carpenters and artisans who built the mansions on Beacon Hill are almost overshadowed by tall trees that turn golden as the fall progresses. Walk down the narrow streets to appreciate the colors up close. In Back Bay, Commonwealth Avenue - a magnificent statue-filled boulevard with a long park down the middle - is spectacular. Start at the Public Garden, walk down Comm Ave all the way to Hereford Street, turn right and walk another block, and then turn right again and walk back on Marlborough Street. Magnolias, so magnificent when blooming in the spring, now make a swath of gold. 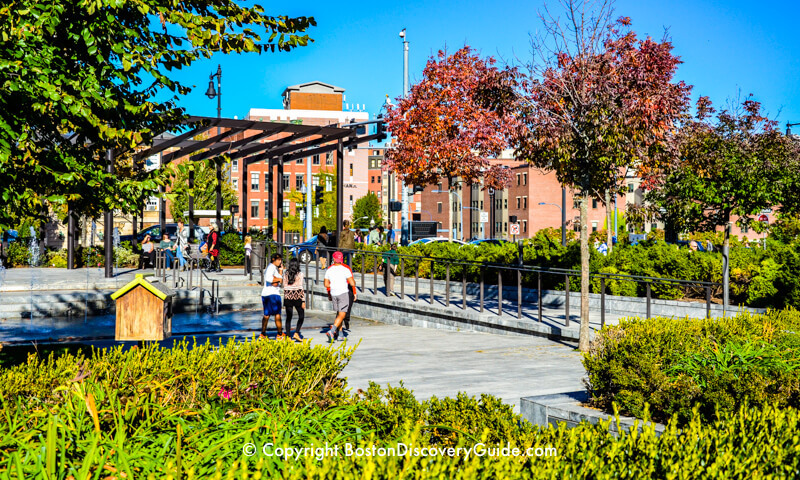 The Southwest Corridor Park provides a perfect starting point for leaf viewing in the South End. From Back Bay Station, cross Dartmouth Street to the park's entrance. Walk as far as you want, enjoying the colorful gardens and trees. Then either come back the same way or detour through the neighborhood's small streets, enjoying how the crimsons and maroons of the Boston fall foliage harmonize with the red brick Victorians. Location: Orient yourself using Boston Common and the Public Garden. 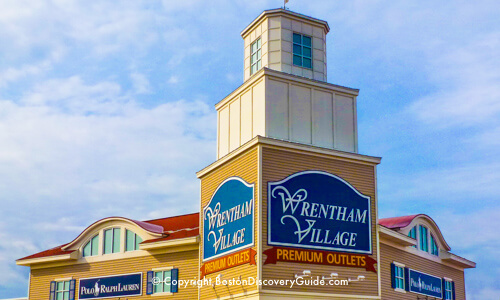 - Bay Village is south of the Public Garden; walk south down Arlington Street for 3 blocks and make a right onto Piedmont Street to start exploring the neighborhood. - Back Bay is to the west of the Public Garden, across Arlington Street. - South End is to the south of Back Bay . . . generally Huntington Ave is considered the boundary. You can find an entrance to the Southwest Corridor on Dartmouth Street between Stuart Street and Columbus Ave. 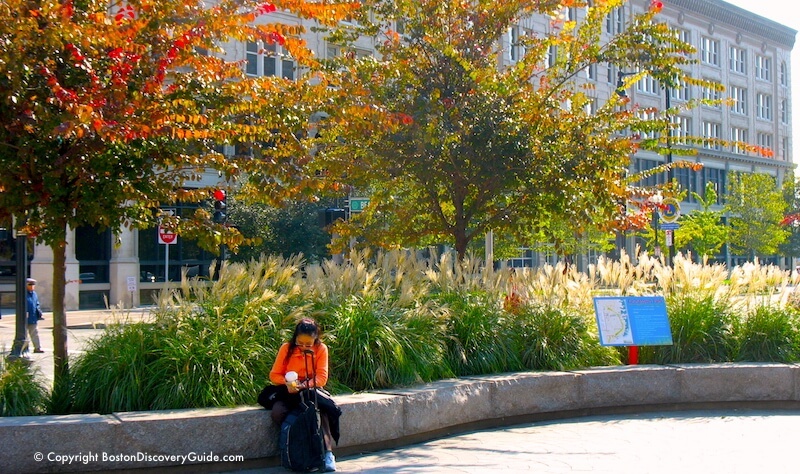 Trees, shrubs, perennials, and ornamental grasses along the Rose Kennedy Greenway extend Boston's fall foliage display in areas formerly devoid of any color other than gray, and their brilliant fall hues draw crowds of admirers. An especially brilliant area is the Chinatown section, where the colorful leaves of peonies, rhododendrons, small trees, and grasses along the stream and waterfall provide an especially lovely spot for a stroll. For an added plus, pop into one of Chinatown's mouth-watering bakeries or restaurants, bring back a carry-out snack, sit on one of the Greenway's benches, and enjoy your impromptu picnic. On Sundays, check out all the dim sum possibilities. 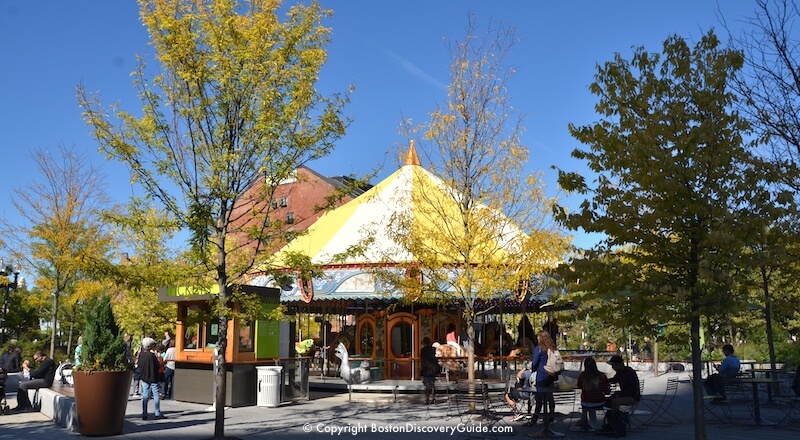 To enjoy more colorful trees along the Greenway, continue walking north to the North End and stop for a carousel ride to enjoy the autumn sunshine. Nearest T station: Red line/South Station; walk up Essex Street to the Greenway, and turn left to walk along the Chinatown section. Home to Boston's Fenway Park, the city's Fenway neighborhood is filled with tree-lined streets turning golden during October, the jewel-like Ramler Park overflowing with colorful leaves and late-blooming roses, and the tree-filled Back Bay Fens, a lush slice of nature along Muddy River and practically in the shadow of the famed baseball field. 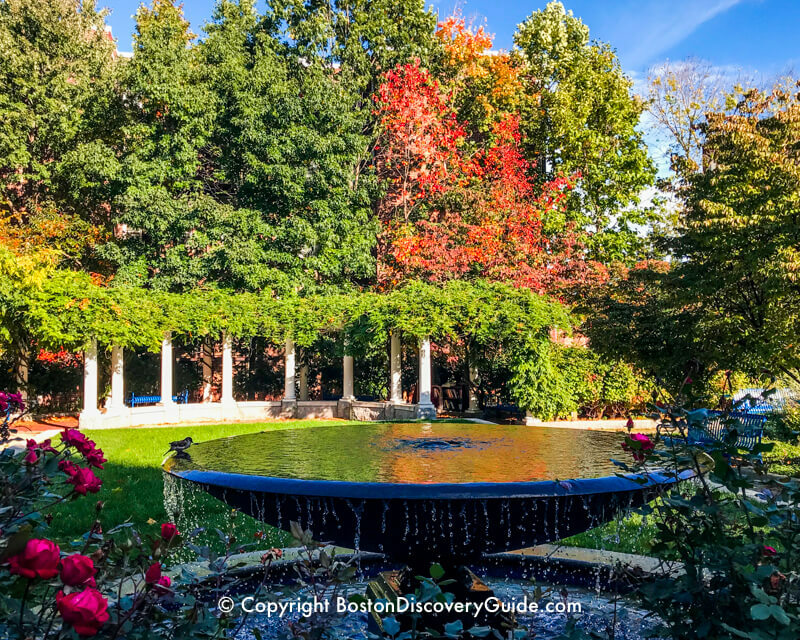 To see some of the most brilliant foliage in the Fens, find the sections containing Boston's famed Victory Gardens and nearby Kelleher Rose Gardens where you may see late-blooming roses even during the early days of December. Nearest T station: Green Line/D to Fenway Station. Walk down Park Drive to Peterborough Street, and turn left. The park is on your right. Nearest T station: Green Line to Hynes Convention Center. The Victory Gardens are near the northwest tip of the Fens. You'll see the entrance to the Victory Gardens near the Park/Boylston Streets intersection. 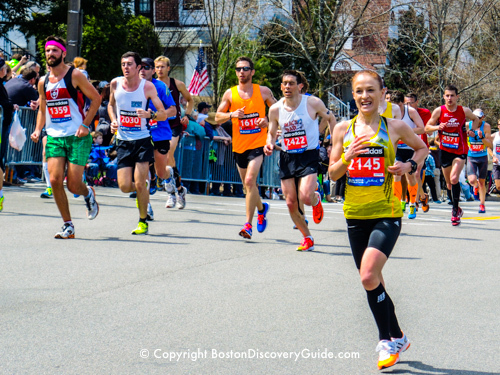 Keep walking down Park Street away from Boylston Street to reach the Rose Garden. Walk across the Longfellow Bridge near Beacon Hill to see fall foliage along Boston's skyline from the Cambridge side of the Charles River. Cambridge has its own share of brilliantly colored trees. Walk (or run) down the length of the Charles River Embankment to enjoy the bright hues of the cherry and maple trees along the river. Where better to see a magnificent display of Boston fall foliage than the Arnold Arboretum, another jewel in Boston's Emerald Necklace. The Arboretum's collection of almost 5,000 different species put on a fiery display throughout most of the month of October. Located in the Jamaica Plain neighborhood of Boston, the 265 acre Arboretum is open from sunrise to sundown every day of the year, and admission is free of charge. The Arboretum's free Boston Fall Foliage Festival takes place during the afternoon on the last Sunday of October. 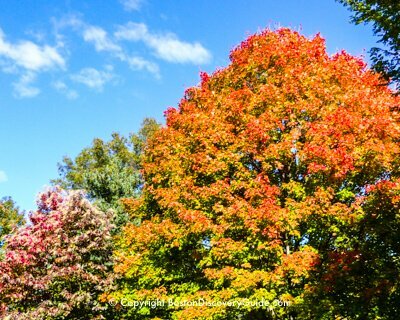 Meet on the Hunnewell Visitor Center lawn to learn about the best trees and shrubs for fall color, take a guided tour of the Arboretum's most brilliant foliage areas, and enjoy apples, cider, story telling, music, and leaf crafts. Getting there: Exit through the door marked "Arnold Arboretum." Walk about 60 feet, turn left, and continue walking parallel to the Arborway (elevated above the bus stop). Walk along the Arborway, go up the hill, and enter through the Arboretum's Forest Hills gate. To get to the Arboretum's main entrance and the Hunnewell Building, continue along the Arborway for about 8-10 minutes. The Arboretum is located at 125 Arborway. For more information: 617-524-1718 . 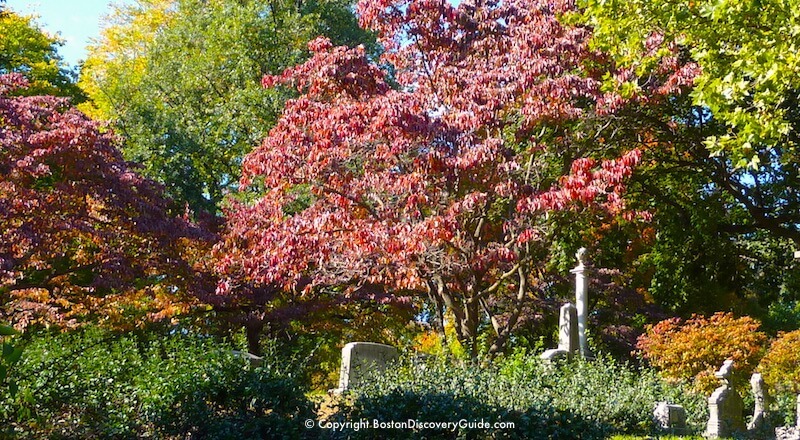 With more than 5,000 trees representing 630 species, Mount Auburn Cemetery is one of the best spots to view masses of Boston fall foliage, as well as resident and migrating birds. Have your camera or phone handy, and wear comfortable walking shoes. Founded in 1831 by the Massachusetts Horticultural Society on 175 acres of wooded rolling hills just to the west of Boston, Mount Auburn quickly became known as America's first garden cemetery. You'll find lots to explore among its hills, dells, ponds, and woodlands - and from late September into late November, colorful leaves make a magnificent display. Because of the variety in elevations, you'll find many perfect vistas of vivid colors. Although Mount Auburn Cemetery is actually in Cambridge, just to the north of Boston, you can get there easily on the subway and bus. Location: Mt. Auburn is located about 2 miles west of Boston, at 580 Mount Auburn Street, Cambridge, MA. Getting there by T (Boston's subway) and bus: Take the Red Line to Harvard Square. 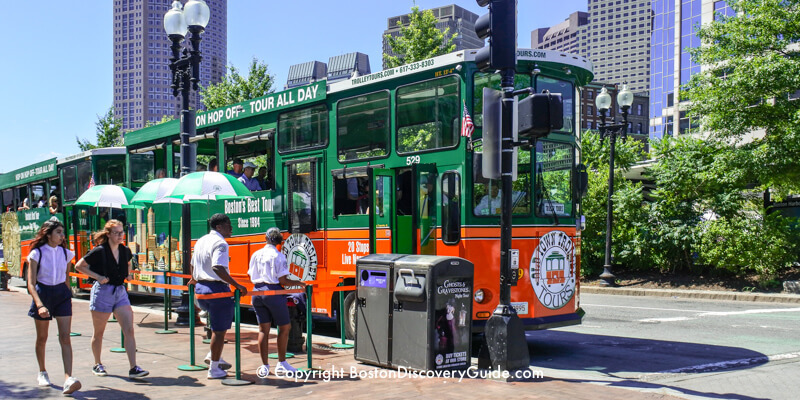 Staying inside Harvard Square Station, walk over to the bus departure area and take either the Watertown Square (#71) or Waverley Square trolley (#73). Get off on Mount Auburn Street at the Aberdeen Avenue intersection (ask the driver to let you know when this is coming up, if you're not familiar with this part of Cambridge). Cross Mount Auburn at the traffic light and go through the Cemetery's entrance gate. 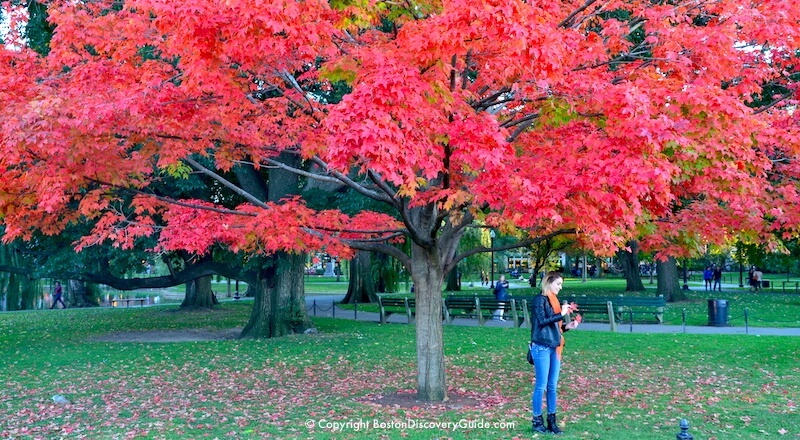 Wondering when to plan your Boston fall foliage tour? 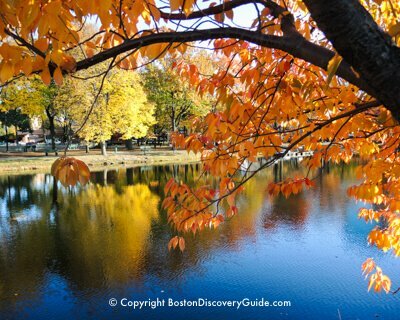 Fall leaf color begins in Boston at a different time each year . 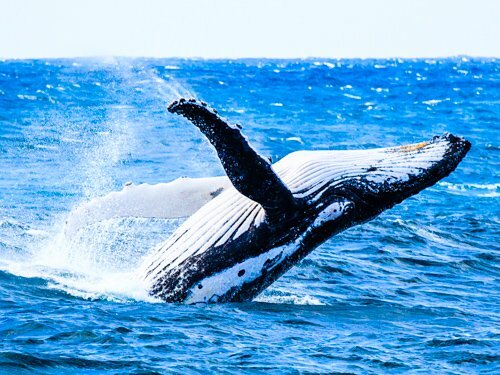 . . but generally speaking, you'll start to see splashes of color during the second or third week in September. 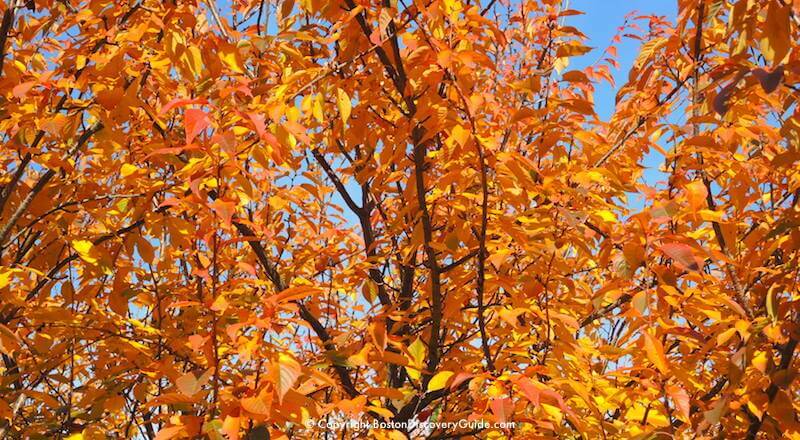 Occasionally, leaves start to change color even earlier in the month, especially if not much rain has fallen during the summer. By early October, fall leaf color becomes more pronounced, as seasonal changes trigger a break-down of chlorophyll production and causes green leaves to turn brilliant shades of yellow, red, purple, and eventually brown. "Peak" usually happens during the 3rd week of October - although don't be surprised if it occurs a week or two earlier or later. What is "peak"? The definition varies - but think of it as meaning around that magical moment when around 50% of leaves in a particular location have turned golden, crimson, or other vivid non-brown, non-green shades. By mid to late November, the most brilliant fall leaf color may be gone, but you'll still see plenty of subdued color before real winter sets it. Occasionally, traces remain even into early December.